1. Illegally accepting campaign contributions for Governor John Engler's Leadership PAC in 2000. I have attached the most pertinent campaign finance disclosure records. For further information see MI committee id # 509688-9 for Maloney and MI Committee # 509596-6 for John Engler. The activity in question involves the 10/2/00 refund check for $9,850 sent by the Maloney Committee to Gov. Engler due to excessive campaign contributions, and the $15,750 contribution Maloney accepted from same PAC on 10/27/00. I have also attached information regarding a questionable $175,000 loan from McKinley Associates (i.e. Mr. Ron Wieser) to Gov. Engler's PAC on 10/20/00 which provided the funds necessary for the $15,750 contribution to Maloney on 10/27/00. i. A lack of cross examination of approx 2/3 of witnesses when the testimony of many witnesses was if not right out lies, at least highly suspect. ii. Failure to call critical parties to testify before his Court. This includes any member of the Board of Canvassers, a majority of alleged victims of voter fraud, and the person alleged with organizing the said fraud, Rev. Edward Pinkney. Rev. Pinkney in fact, could have provided essential evidence, including DNA and a polygraph that would have contradicted the most important alleged evidence of the prosecution. iii. Allowing the prosecutor to admit numerous exhibits based on testimony of a witness who stated information that was impossible for the witness to know (see tape at time: 13:58.28, 4/12/05). For example, the prosecutor asks “do you know James Cooper?” The witness responds, “not by name.” Then the people ask, “do you know if he voted at that time from the soup kitchen?” The witness answers, “I don't know,” The next question was “do you recognize that person as someone voting from the soup kitchen?” “Yes,” the witness responds. And that exhibit was allowed to be admitted into evidence without any further questioning and no objection! Immediately one notices three problems with this type of standard for truth in court. First, it is not possible for someone lacking the capacity to identify a person by name to thirty seconds later recognize their signature. Furthermore, the witness stated she did not know if James Cooper was from the soup kitchen; but then, as if by magic, she can recognize his signature and know that he came from the soup kitchen. And these contradictory statements are accepted as the standard of proof! Here is a crystal clear example of Maloney letting falsity stand for fact. Now, and this is the second problem, a major argument the prosecution raised against the Benton Harbor clerk was alleging the clerk failed to check the voter application signature against the signature on the “master registration card.” Think about that for a minute. How is it that the prosecutor can argue that because the Clerk provided the opportunity for fraud in failing to verify a voter's signature against a reference card, then turn around to argue that a witness's identification of a signature - of a person whose name she couldn't identify - should be taken as proof? Finally the third problem is the fact that no person voting at the polls has their signature checked against a registration card. Any voter need only produce their name. Does the State claim that these votes should too be thrown out because the State can't trust that the voter is who they claim? If not verifying the signature of voters was the standard, not a single vote in any Michigan election would count. Not a single one of these serious issues were ever mentioned. These contradictory “proofs” and inconsistent standards for voter identification were admitted without objection from either the defense or questions from the judge. And this type of behavior is supposed to earn judge Maloney more power! iv. Failing to inquire about the sworn testimony by a witness indicating police manipulation and intimidation of persons during the investigation stage (see tape at time: 11:50.00, date 4/13/05). B. An insufficient number of challengeable votes to overturn the recall election. The number of alleged fraudulent ballots did not reach the mathematical bright line necessary to affect the election outcome. The margin for recall was 51 votes. Even if you accept Maloney's statement made in his judgment that 27 votes were invalid based on defendants concession there still remained a 24 vote margin, not enough to set aside an election. If there had been adequate representation for the majority of Benton Harbor voters the number of conceded ballots would have been far below 27. I counted only 3 votes that necessitated invalidation because they involved errors in mandatory provision. The remaining ballots fell within the category of failing to follow directory provisions. The signature issue for example. Michigan law declares that errors involving directory rules is not a sufficient reason to invalidate those votes. As a poll inspector and as citizen committed to democracy, I find his judgment woefully unsupported by the facts in this case. Don't just believe me though examine the tapes yourselves. I have included copies of the tapes, as well as the tape date and time for all examples cited above for your convenience. These represent just a few examples of Paul Maloney's utter lack of care in establishing the relevant facts in a decision that extended judicial power into legislative territory. Maloney declared the case was to be decided based on the “totality of the circumstances.” How is this possible without the testimony from all essential parties? If the totality of circumstances were to be used as the basis for his judgment, why did he fail to obtain evidence necessary to base his decision on that totality? I can think of only one reason. If the committee decides to make a diligent inquiry into this matter, I doubt it will fail to reach the same conclusion. The day after election trial, Rev. 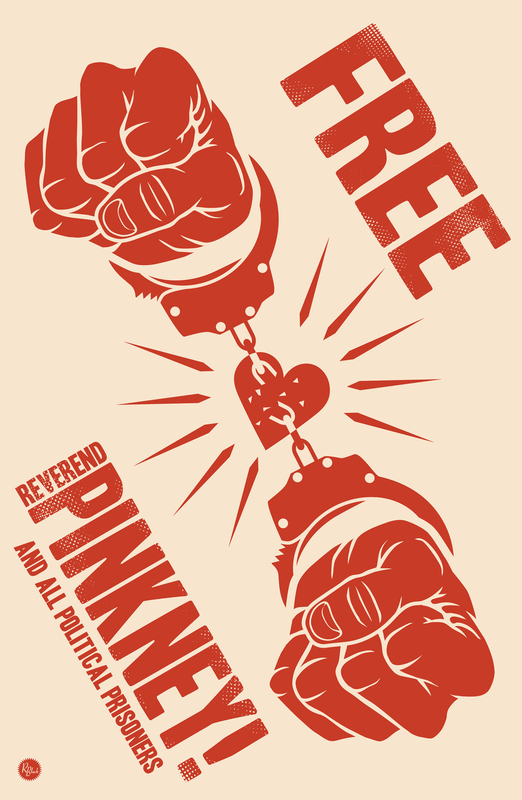 Pinkney was arrested. Surely some reason was needed in order to justify this blatantly illegal judgment. Rev. Pinkney actions represented, in the words of the defense, “an outside political wind.” In part, this is correct. Indeed, there was a strong wind blowing, a wind that blew out of office a commissioner who exemplified local corruption; however, Rev. 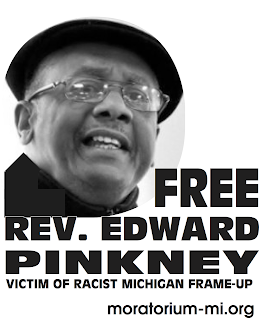 Pinkney is a legal resident of Benton Harbor. It is also true that Rev. Pinkney proved to represent a serious challenge to the local power structure. In that sense then, there is outside political wind blowing. But do not be deceived by the cunningness of the fox, for their files are empty. This was simply a case of smoke and mirrors that any federal judge must have the capacity to see through. Listen to the charges for a moment. The State alledges he paid people $5.00 to vote. Rev Pinkney claims, a claim supported by a polygraph, that he paid people $5.00 to distribute fliers. I am quite confident that every member of this committee paid at least one campaign worker. I'd also go out on a limb and assume that more than $5.00 was paid to your campaign employees. Please excuse me for this assumption if it proves incorrect. Now, your paying campaign workers and Rev. Pinkney paying for the distribution of fliers are functionally equivalent. At least, I can't see how their different. If anyone can tell me how these two activities are not equivalent please let me know. The second charge, a felony mind you, is that Rev. Pinkney was in possession of absentee ballots. Reflect on that for a moment. So what if Pinkney enables people to exercise their right to vote by giving legal voters postage stamps and placing them in the mail, as the prosecution contends. In fact, this latter charge is also one Pinkney denies - a claim that is supported by a polygraph test. But that's not the important issue. It is what is called a false problem. Why? Because no one ever accused Pinkney of intimidation or harassment, nor did the State claim that he altered any of the ballots he is accused of being in procession of. Given the disenfranchisement that plagues Benton Harbor, the fact Pinkney was enabling people to vote should be encouraged. This brings us to another serious problem in the civil trial. One reason given by Maloney for setting aside the election was the “suspiciously high number of absentee ballots.” One again this is a false issue. The real question is why there wasn't 100% voter turnout. But then that too must be evidence for invalidating the election. If one adheres to Maloney's line of reasoning, full participation must represent evidence of fraud if 47% participation does. Civic participation must be encouraged. People who enable others to exercise their voting rights must be honored not criminalized. Sadly, the criminalization of civic participation is exactly what is happening here. Finally, even if you accept the prosecutions argument that Rev. Pinkney paid voters $5.00 to vote, the only difference between the Reverends action's and Maloney accepting contributions from Congressman Fred Upton is one of degree. Since the Upton family contributed $1,300 to Maloney's campaign, and the fact that the successful recall election would have blocked the sale of Benton Harbor land to a corporation established by Whirlpool - a corporation founded by the Upton's grandfather. Now, who is buying whom here? Which action again is more questionable? Rev. Pinkney denies he paid anyone to vote, but Maloney cannot hide his campaign finance records. It is the duty of this committee to safeguard the people from this complacent, biased, or outright corrupt judge. Based on the evidence discussed above, I ask you to deny giving Paul Maloney even greater power by rejecting his nomination for appointment to the Federal Court. I would also recommend that the committee consider appointing a special investigative team into Maloney's campaign contributions as they might be the motivation for the election ruling. Democracy must be defended. I seriously doubt Paul Maloney ability to provide that defense given his actions. If the committee requires any further information I can be reach by mail at [edited]. Thank you for your considerations.